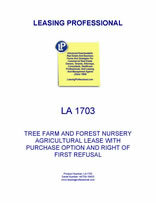 This form is for the lease of substantial acreage for the purpose of growing trees for resale by the tenant. The form grants the tenant a purchase option for the property and a right of first refusal for the property in the event the landlord wishes to sell during the term. The landlord's water rights are assigned to the tenant during the term of the lease. Rent is paid monthly and is stipulated in the lease. All taxes, including water district taxes are payable by the tenant during the term of the lease. Likewise, utilities are payable by the tenant during the lease. This Lease ("Lease") is made as of _________________, by and between AGRICULTURAL PROPERTY LANDLORD, INC., a __________________ corporation ("Landlord"), and AGREEABLE AGRICULTURAL TENANT, INC., a _________________ corporation ("Tenant"). A. Landlord is the owner of that certain real property located in _________ County, _________, consisting of approximately ____ acres, more or less, as more particularly described on Exhibit "A" attached hereto and incorporated herein by this reference (the "Property"). B. Landlord desires to lease the Property to Tenant and Tenant desires to lease the Property from Landlord pursuant to the terms and conditions contained in this Lease. 1. Leased Premises. Landlord hereby leases to Tenant, and Tenant hereby leases from Landlord, upon the terms and conditions set forth in this Lease, the approximately ______ acres of real property described in Exhibit "A", together with all improvements and structures thereon and all appurtenant rights thereto, including, without limitation, wells, pumps, motors, electrical panels, electrical hookups, water discharge facilities, pipelines, irrigation systems, easements, rights-of-way for ingress and egress, licenses and water rights and privileges, which water rights and privileges include, without limitation, any and all rights such real property may have, or that Landlord may have with respect to such real property, including any above-ground and below-ground pipeline, rights, easements, licenses or privileges with respect to any canal or distribution integration program, to receive irrigation water from _________ Irrigation District ("Irrigation District") (collectively, the "Premises"). 2. Term. The term of this Lease shall commence on the Effective Date, and end on ___________ (the "Lease Term"). 3. Rent. As and for rental of the Property, Tenant shall pay to Landlord annually the sum of ________ and No/100 Dollars ($____) per acre, for a total annual rent of ____________ and No/100 Dollars ($_____). The rent shall be paid in equal monthly installments of _______________ Dollars ($______) due in arrears on the last day of each month. Tenant shall pay the rent to Landlord at Landlord's address for notices hereunder or at such other place as Landlord shall from time to time designate in writing. 4. Real Property and Water District Taxes and Assessments; Water Costs. All real estate taxes, assessments or similar levies of any kind and all water district taxes, assessments or similar levies of any kind levied against the Property at the inception date of this Lease and assessed or falling due during the Lease Term shall be paid by Tenant. All such taxes, assessments or similar levies shall be pro-rated for Tenant's period of occupancy. All taxes and assessments assessed against or attributable to improvements placed upon the Property by the Tenant and Tenant's personal property on the Property, shall be paid by Tenant. The cost of water, together with any water standby or other charges, necessary for the adequate and proper irrigation of crops grown on the Property shall be borne by Tenant. 5. Utilities. Tenant shall pay for all charges for light, power, and all other services and utilities supplied to the Property during the Lease Term. 6. Water Supply. Any and all of Landlord's rights to extract any groundwater beneath the Property, use of any Irrigation District facilities serving the Property, and any future allocations of irrigation water from Irrigation District to which the Property might be entitled during the Term of this Lease are hereby transferred to Tenant for the Term of this Lease. 7. Compliance with Laws; Waste. (a) Compliance with Laws. Tenant shall not do or suffer to be done on or about the Property, anything that would or does violate or conflict with any law, ordinance, rule or regulation now in force or effect, or that may hereinafter be enacted, promulgated or adopted by Federal, State or local authority. (b) Waste. Tenant shall not commit or suffer to be committed any waste on the Property (provided that, the use or application of pesticides, herbicides, sprays or other materials on the Property or on any crops, in accordance with federal, state or county laws and regulations, shall not constitute waste). Tenant shall not maintain any nuisance on the Property, and shall not use the Property for any unlawful purposes. Landlord and Tenant acknowledge and agree that any and all deterioration of the Property due to salinity, drainage and related problems or the use of the Property by Tenant in accordance with normal and customary agricultural practices does not constitute waste or a nuisance or a breach of any of the terms of this Lease.